Your first step to better budgeting is finding a motivating factor that will keep you surging onward even in the face of boredom. I used to dread budgeting too, but after printing up pictures of things I would like to have or do (travel, new laptop, etc. ), I noticed a substantial boost in my enthusiasm level. Having these pictures (or just visualizations, if you prefer) with me constantly — on the refrigerator, in the car, on the bathroom mirror — was helpful in keeping my mind focused on the goal at hand. We don’t live in a fantasy world, though, so in order to achieve our goals, we need to put in a little (or a lot of) effort along the way. Visualizing or seeing your goals in pictorial format serves as a constant reminder why you’re planning out your financial future in the first place. If you need an extra "kick," then perhaps keep a diary or start your own blog to keep track of your process (again, keeping you continuously focused on the end goal). The Budgeting Babe has an excellent list of budgeting blogs on her website. Check out some of the blogs listed to help you kick-start your own foray into the realm of numbers and dollar signs. And consider starting your own blog or diary (or discussing your budgeting goals with a trusted friend or spouse) to keep yourself accountable for your financial situation, and thus, more likely to succeed. Now that you’re motivated and being held accountable, let’s get down to the actual process. All work and no play makes one a dull budgeter. Challenging yourself to spend under $___ amount in a given category each month can get your mind off the mind-numbing calculations and more engaged with the goal of saving money. If you “win,” then at the end of the month, go out and splurge a little as your reward. Just as the dieting process is nearly impossible for most people without a break (comfort food! ), budgeting will grow old very quickly if you don’t reward yourself for milestones along the way. Furthermore, there are some websites and smartphone apps that can help you compose your budget in the form of colorful pie charts, which are more fun to work with and look at than just a plain spreadsheet. Two of the best websites for this process are Mint and PearBudget. Again with the dieting references, “crashing” your way through this mildly unpleasant task is not going to work. In order to maintain a suitable level of drive and succeed in creating a functional budget, you ought to take things in little steps. Phase unnecessary expenses out slowly and factor in a savings category as your excess income builds up over the course of time. Also, fewer categories will help — not only does this mean there is less to keep track of overall, but it decreases the amount of time you’ll need to spend pouring over spreadsheets and bill categorization. Speaking of bills, having as many online payments as you are comfortable with can speed up the initial formation of your budget, producing a low-maintenance, almost-automated system to help guide you through your finances in the future. Budgeting isn’t difficult unless you make it so. Take a personal finance class or read blogs if you need added help (coming to Wise Bread is a fantastic start!). With proper planning (with fun elements thrown in), you will have a budget up and running in no time. Tell us about your budgeting tips in the comments below. 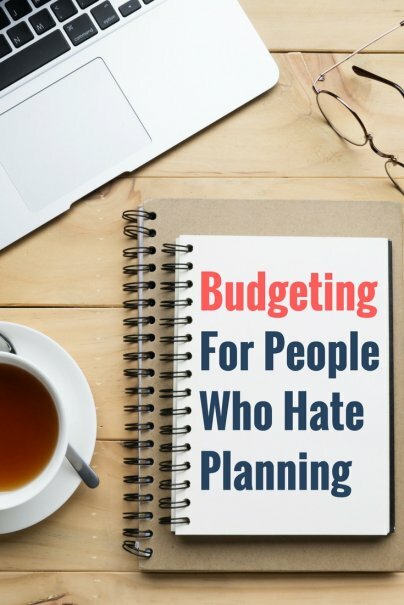 I think that if you hate planning, then don't budget. Automate your savings, pay yourself first, do that little bit of extra work at the beginning, and reevaluate once something changes. Setting aside some time to record what you've purchased is important. It will also help you to see if you're staying on track. Set aside some time either daily or weekly (if you don't like planning you may want to only do it weekly). Perhaps most important is motivation. If it's boring or you don't see a point to it, you may stop doing it. If you set up a reward for yourself, it could increase your motivation. It's so hard to find a happy balance between budgets and fun, something i'm still battling with even now! That said, it is so important to budget especially in the current economic climate. I like to budget for a while and then reward myself with something i've wanted for ages! Budgeting is definitely not on my top of things to do list but I seriously need to start. Planning is the difficult part for me but I'll try to make it fun and see how it works out. I love planning but for some reason I never created and followed a budget in my life. I guess that may be why I now have so much debt to pay off. This past December I created by first budget using Excel. It's huge and includes all expenses, debts and income. What an eyeopener. I think the next step is to set some goals on tackling the debt and getting rid of it.